This is one recipe that has been on my “cooking bucket list” for years. My Mom would make this cake for special occasions, and unusual ones too! I think my all time favorite memory was the time I was returning to go to Bible School in England after having spent Christmas with my parents in NJ. My flight was out of John F Kennedy Airport in NY and my Aunt and Uncle who lived in Long Island at the time met up with us… on a day when there had been a snow storm and all the flights were delayed. So here we were in the terminal of the airport eating Black Forest Cherry Cake and having a mini family reunion with jealous passengers looking on in curiosity! Great memory! My High School was located in Kandern, Germany and we sometimes were able to sample the cherries that grew in the Black Forest region. I have fond memories of Europe and still love to eat the foods in that region. The German name for this torte is Schwarzwälder Kirschtorte. 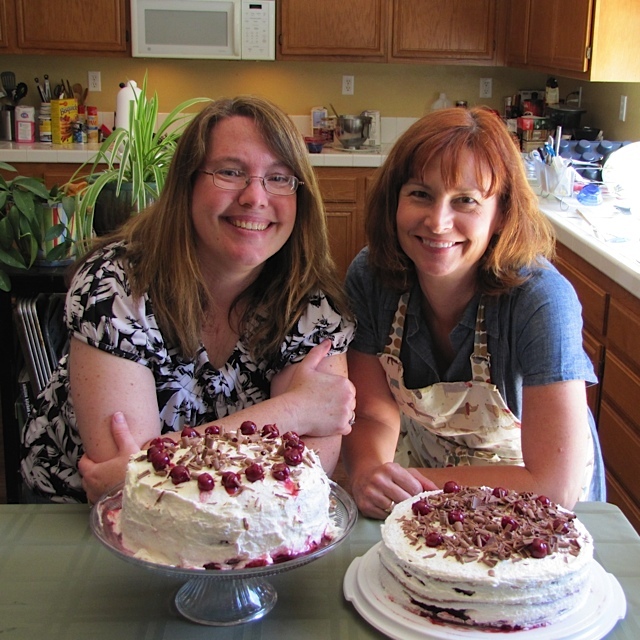 I invited my friend Lori to learn to make this cake too. I cook much more than I bake. Baking is exact science and I have to wait for layers to cool before taking the next step and I am often about instant gratification! Well, we had fun. The cake was not perfect, but it was delicious! This dessert is not overly sweet – I think we American’s use way too much sugar in our desserts. It took us 3 hours start to finish, so it is not a cake you can just pull out of the hat for an event. Plan ahead! It really is best if you refrigerate the cake for 24 hours before cutting into it. The layers will be well refined and the flavors of the kirschwasser will have worked its magic as well. I did not have the patience to wait even an hour after making it, but had some left over the next day, so I really do have to say the 24 hours makes a lot of difference in the flavor and texture. 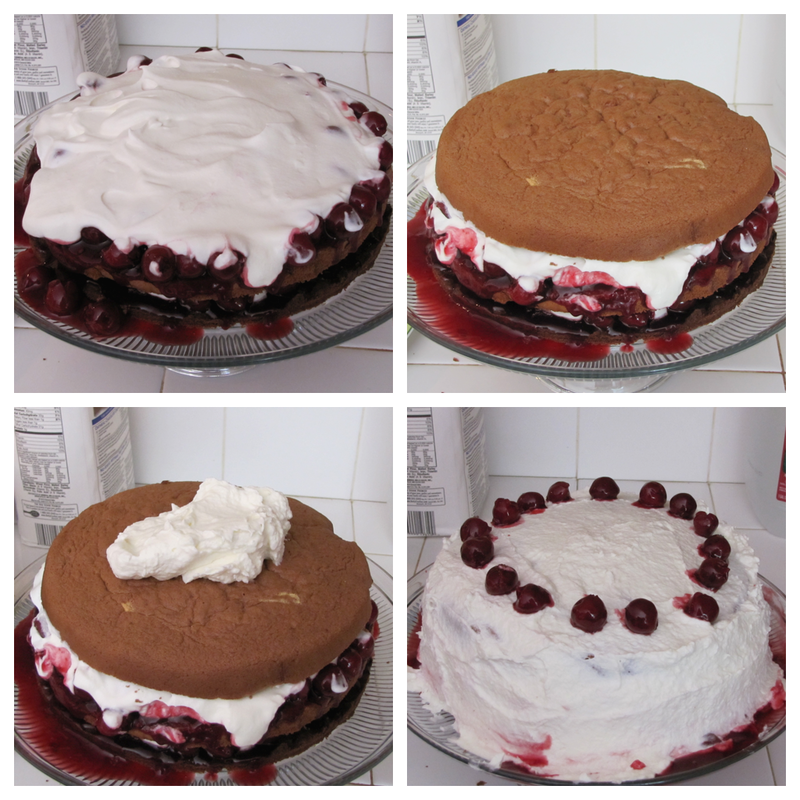 The layers consist of an almost cookie crust chocolate layer as the base, then cherries and whipped cream, then at least two (or if you are great at slicing 3) layers of chocolate sponge cake which are separated by more cherries and whipped cream. 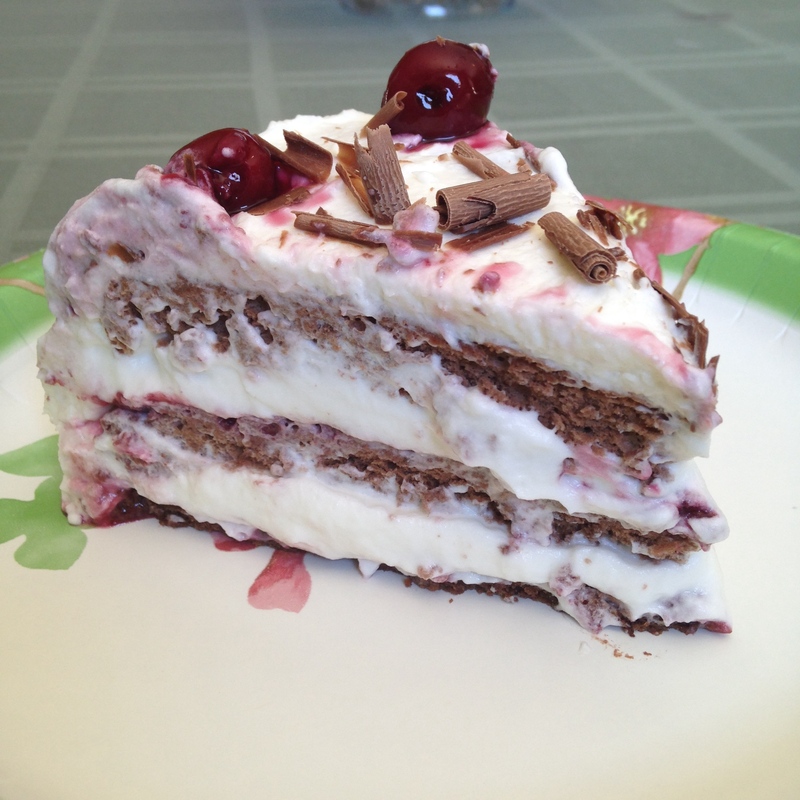 The entire cake is then covered with more whipped cream that has gelatin as a thickener and topped with cherries and sprinkled with milk chocolate shavings. My cherries spilled out of the layers and onto the base of the cake, so when I covered the cake with the coating of whipped cream the cream turned pink in color but it was still beautiful to look at. When I encounter errors like this, I rename it rustic and it is all good! Perfection is for the 4th time I make this! 😉 I used a 9 inch spring form pan to bake my cake, my friend Lori used a 10 inch. 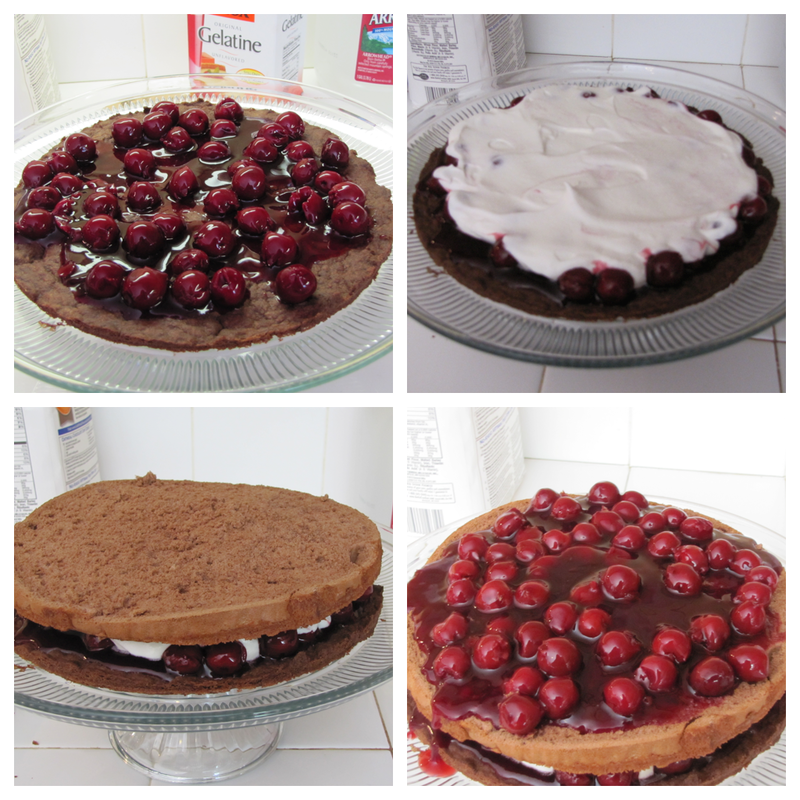 They both turned out great, but mine was a little taller and actually works a little better for this torte. Though the original recipe called for a 10 inch.. use what you have. I found Morello Cherries at Trader Joes (24 oz). They are a product of Germany and are sweet with just a hint of tart. It is with light syrup and needed to be thickened. I added 3 ounces of Kirschwasser (if you really cannot find any, use Rum). 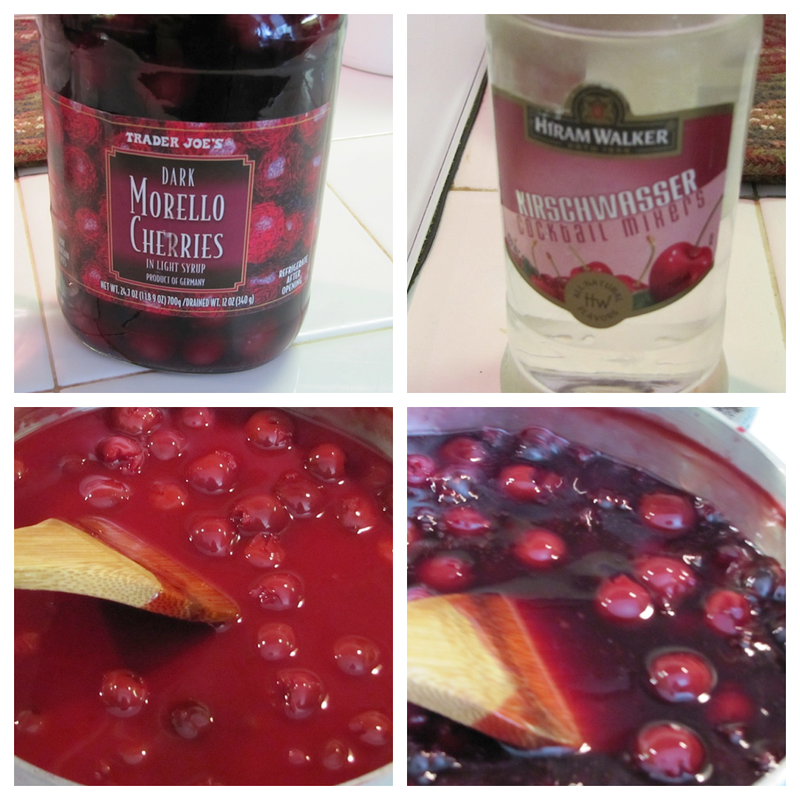 To thicken, I combined 1 tablespoon of cornstarch with 2 tablespoons of cold water and added them to my pan with the cherries and kirschwasser. Bring the mixture to a boil and cook for 30 seconds to a minute longer and the mixture has thickened. Then transfer to a bowl and cool completely. Before you use the cherry filling in the layers pull out 10-20 cherries to decorate the top of your torte. You could use a cherry pie filling, but I find them to be overly sweet. 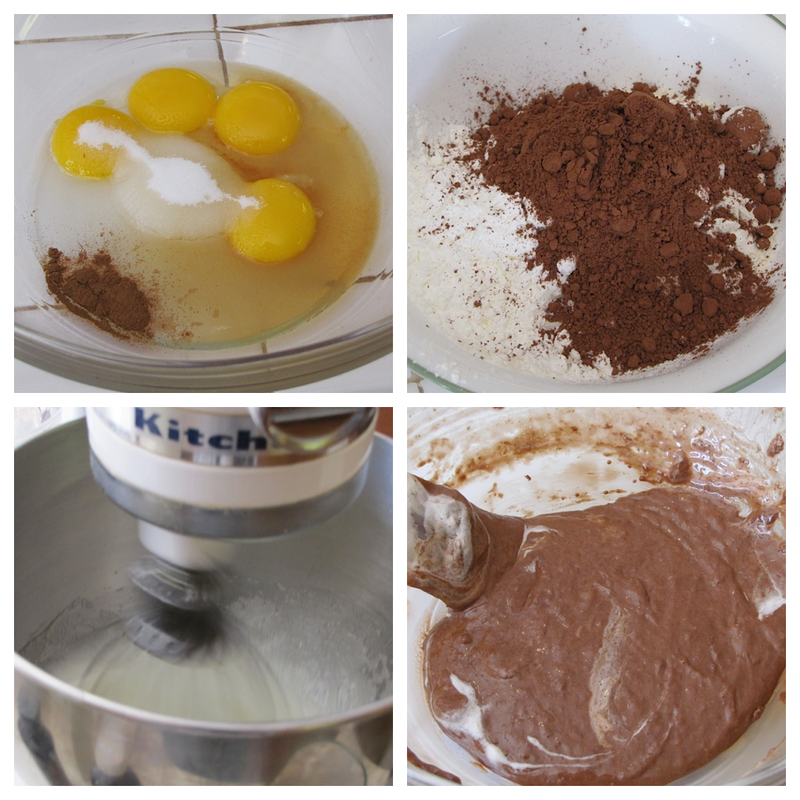 Combine the dry ingredients and whisk them together: 3/4 cup flour, 2 Tablespoons cocoa, 1 teaspoon baking powder. In a separate bowl, combine 1/3 cup melted unsalted butter, 1 teaspoon vanilla, and 1/3 cup sugar. 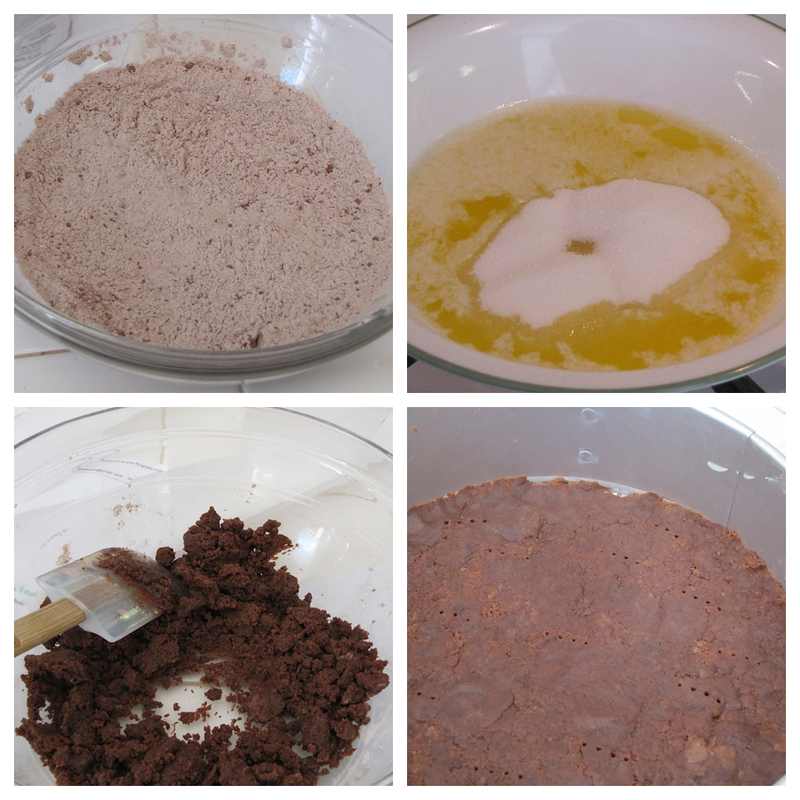 Combine the two mixtures together and make a thick dough. Line a 9 inch spring-form pan with parchment paper. And press the dough into the bottom of the prepared pan. Poke the dough with a fork and then bake for 15 minutes. 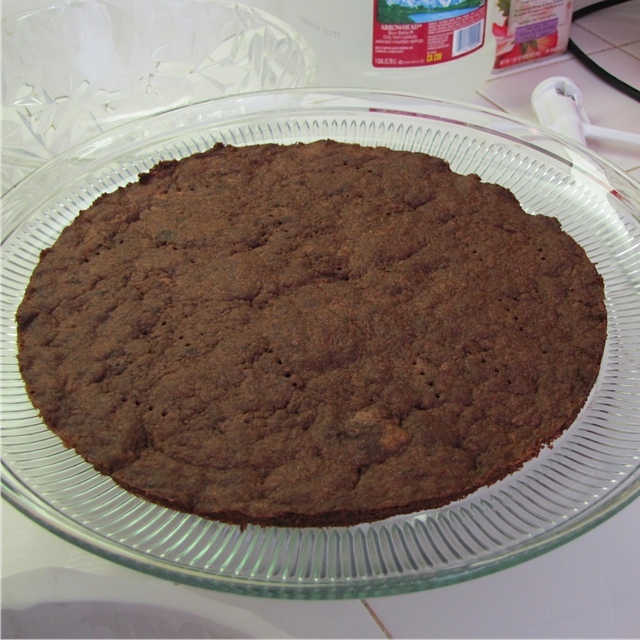 After it baked, allow it to cool in the pan for at least 15 minutes before removing it from the spring-form pan. Carefully transfer to your plate. It may crack, but it will be okay. Be as careful as possible. I allowed this to cool completely while I made the sponge cake layers. Combine 4 egg yolks, 2 tablespoons warm water, 1/3 cup sugar, 1 teaspoon vanilla, 1/2 teaspoon almond flavoring and 1/4 teaspoon of cinnamon. Beat with an electric mixer until the egg yolks are pale. Sift together dry ingredients: 2/3 cup flour, 1/3 cup cornstarch, 2 tablespoons cocoa powder and 1/2 teaspoon baking powder. Whip the 4 egg whites with 1/3 cup of sugar until it is stiff. First add the flour mixture to the egg yolks and combine and then fold the egg whites into the batter using a rubber spatula, about half the egg whites first and then the remaining half of the whipped egg whites after it is fairly well combined. Prepare the spring-form pan for the sponge cake by inserting parchment paper both on the bottom and the sides of the pan. I find that butter keeps it in place nicely and since it is outside the paper does not affect the cake any. Pour the sponge cake batter in and spread it evenly in the pan. Bake at 375°F for 25 to 30 minutes. Cool in the pan for 15 minutes before removing it to a separate plate. Once it cools completely, cut it horizontally into two layers. Try to cut them as evenly as possible. For the Whipped Cream: Beat 2 1/2 cups heavy whipping cream with 1/2 cup powdered sugar. When it is stiff, divide the whipped cream into two batches. Use one half for the filling and the second half will be used for the topping, but is thickened with gelatin for extra stability. 1 1/2 packets of Knox Gelatin is combined with 2 tablespoons of water and brought to a boil and then cooled slightly and whipped into the second batch of whipped cream. Now for the fun stuff: the assembly of your Black Forest Cherry cake. Top your cake base with half of the cherries. Top the cherries with half of the whipped cream (that has not been stabilized with the gelatin). 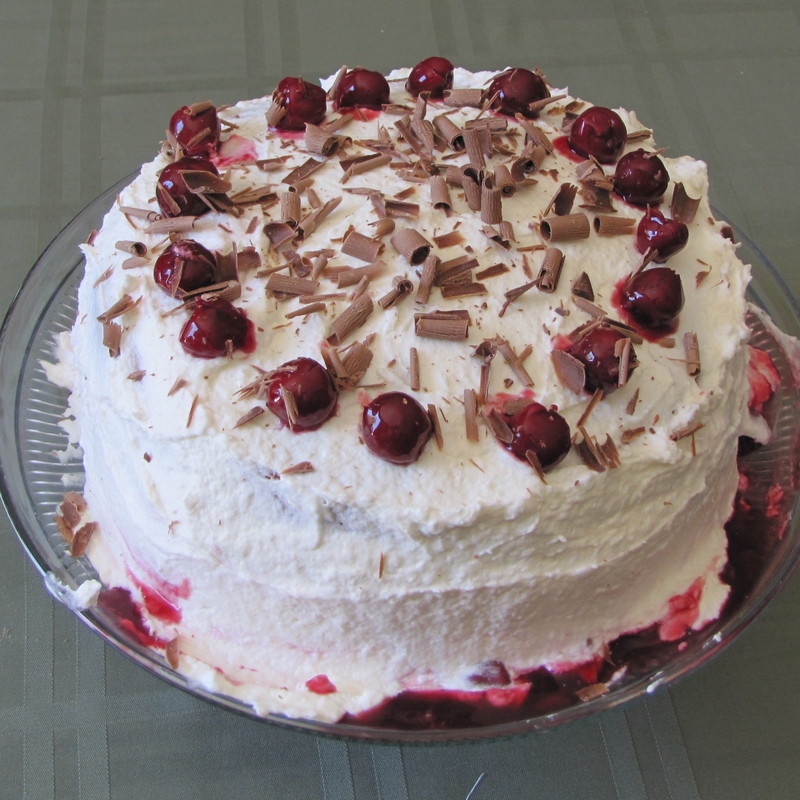 Top with the bottom disk of the sponge cake and repeat by topping with the remaining half of cherries. I should have not put as much of the thickened liquid. It got a little sloppy… but a yummy sloppy, so I am okay with it.. remember if it is not perfect it is rustic! Add the remaining whipped cream (not stabilized batch). Top with second layer of sponge cake. Spread the stabilized whipped cream over the top and sides of the assembled cake. Mine should have been whipped just a tad longer, but it still worked okay. Decorate with a circle of the reserved cherries. Then to finish decorating the torte, use a vegetable peeler and make chocolate curls by “peeling” a bar of milk chocolate over the cake. It is best to let the cake set up in the refrigerator for a few hours before you slice into it. 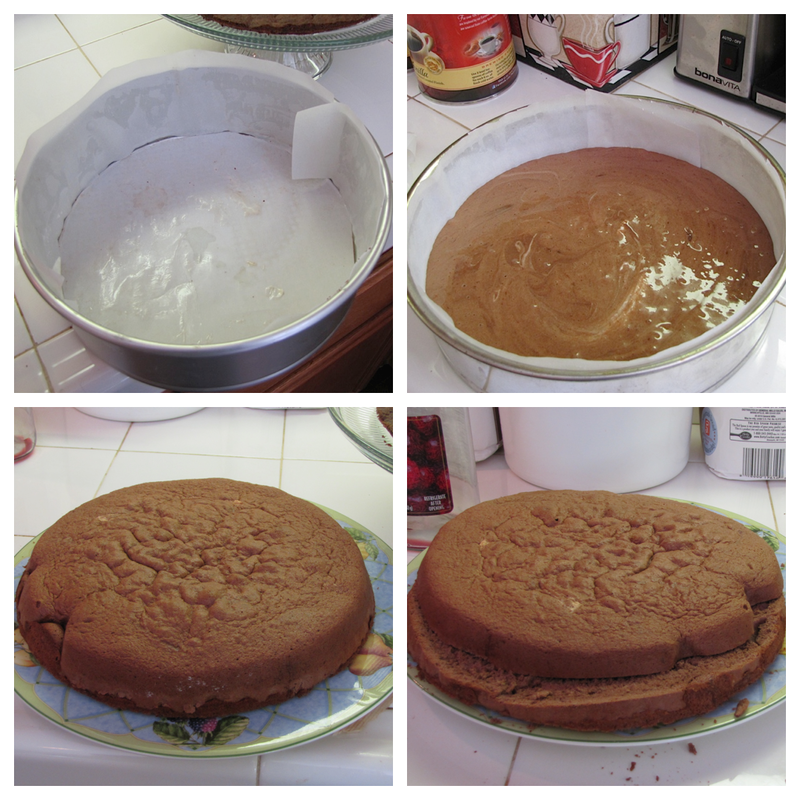 I am an impatient person though and was so excited to have made the cake that I could not wait to try it though. It turned out beautifully! And it was as good as my Mom’s rendition too, which is a bonus.. now if only I could conjure up a snow storm and eat it in an airport! Categories: Baking, Baking - Desserts, Dessert - Cakes, Dessert - Fruit, Desserts, Ethnic, Ethnic - German | Permalink. My husband and I got to enjoy a weekend away for our 21st Anniversary. We made every effort to make our meals the best possible combination. Now, Las Vegas has no shortage of food options. We ate at a breakfast buffet for breakfast and had soup at Noodles in Belagio for lunch before our reservation at Mesa Grill. My husband and I doubted that we would have the appetite to eat anything further. We both felt very full from breakfast and then lunch, but once the food arrived and we started eating, we found we could not stop eating and did not feel badly about it. We ate every last bit of the food served to us at Mesa Grill. 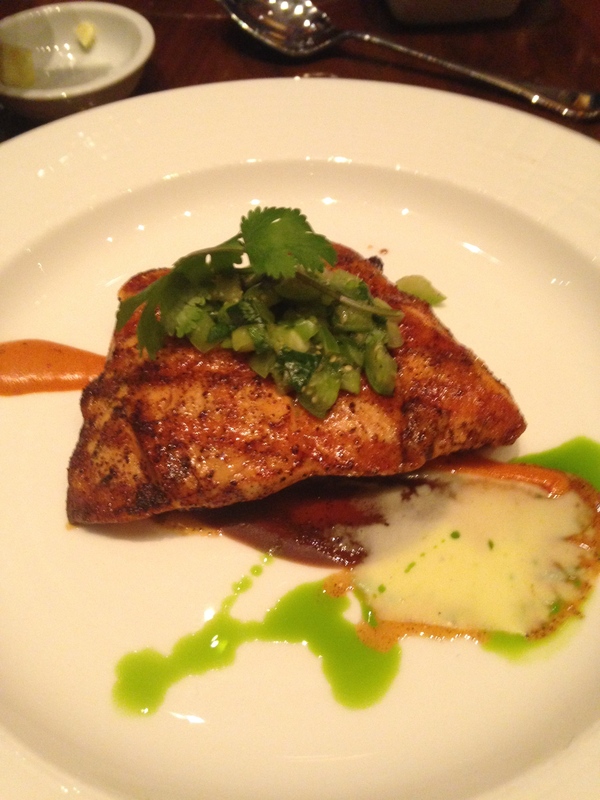 We ate at Bobby Flay’s Mesa Grill in Caesar’s Palace and also at Emeril’s New Orleans Fish House in MGM Grand. If I had to chose one, I would go with Mesa Grill. Every item of our meal there was outstanding! Even the free bread was remarkably delicious! 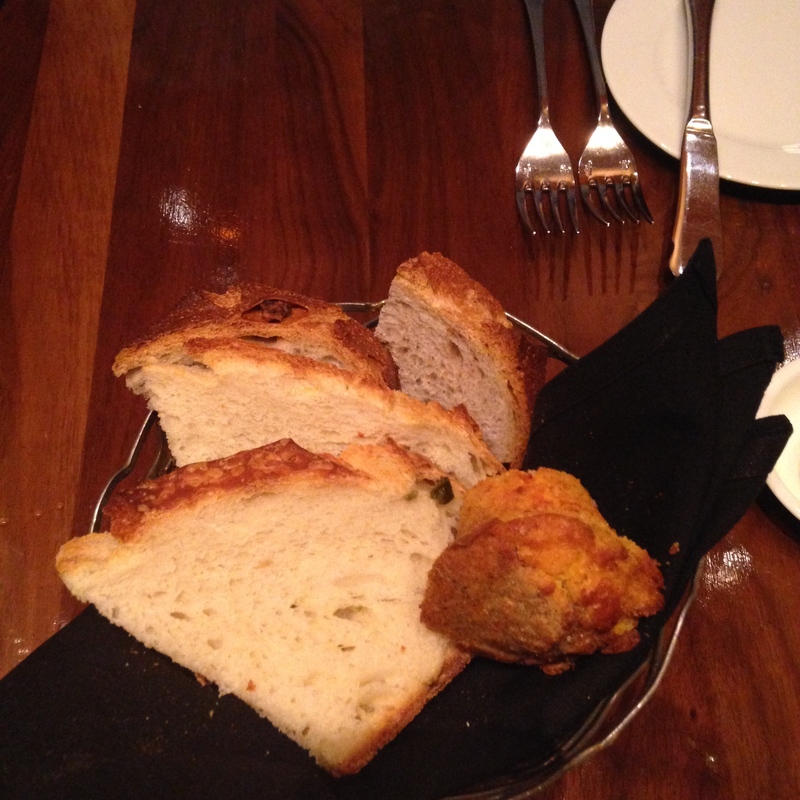 Their Jalapeno bread is among the best I have ever eaten. 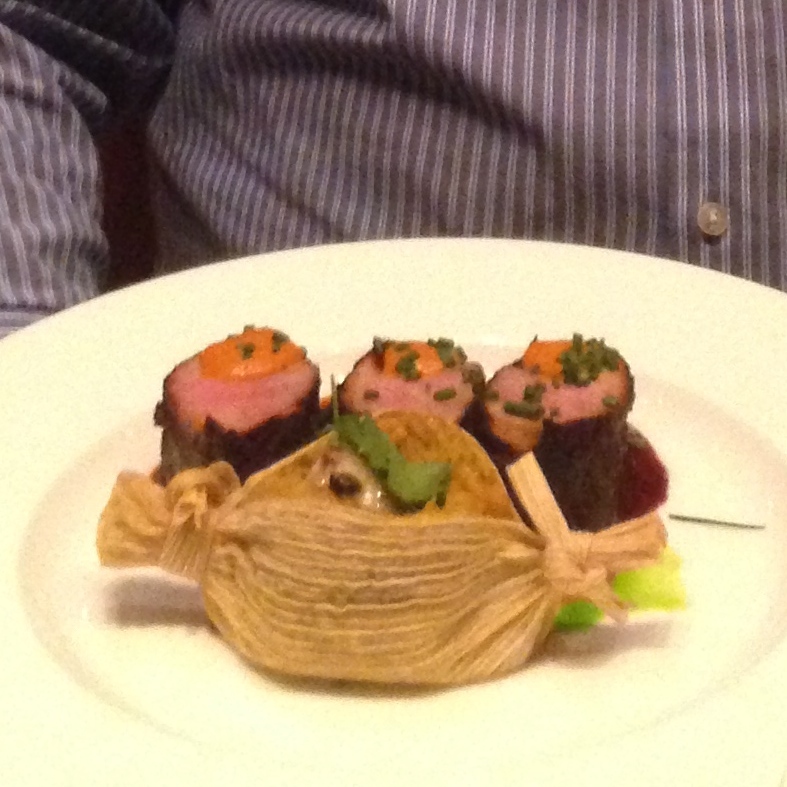 As appetizer we had Goat Cheese Fondido with blue corn tortilla chips. It was outstanding! 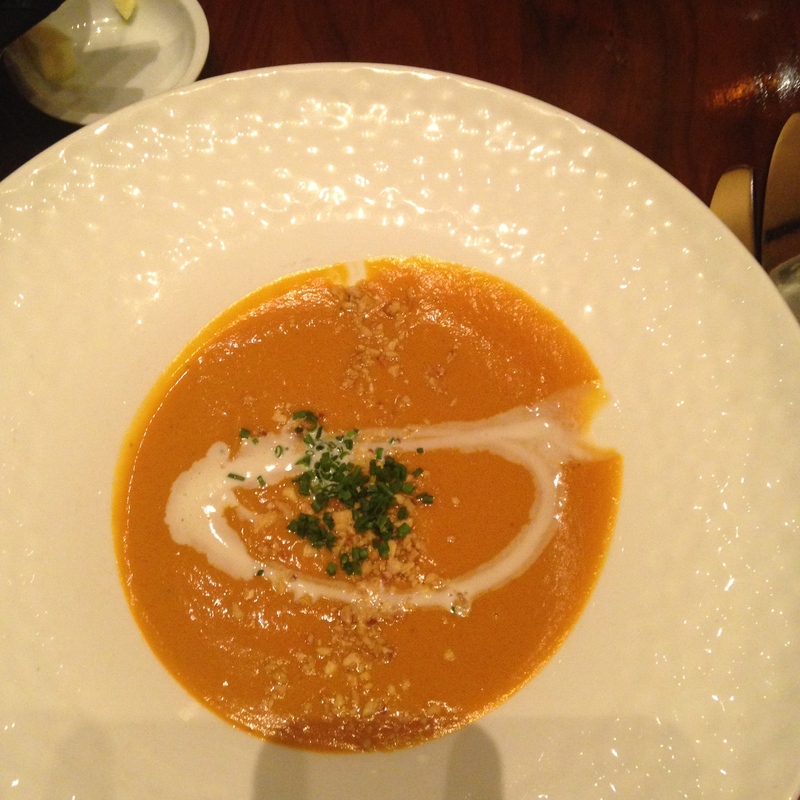 We both enjoyed his pumpkin soup. It was spicy and delicious. I had salmon topped with tomatillo salsa. My husband had the pork tenderloin our side, mashed potatoes. 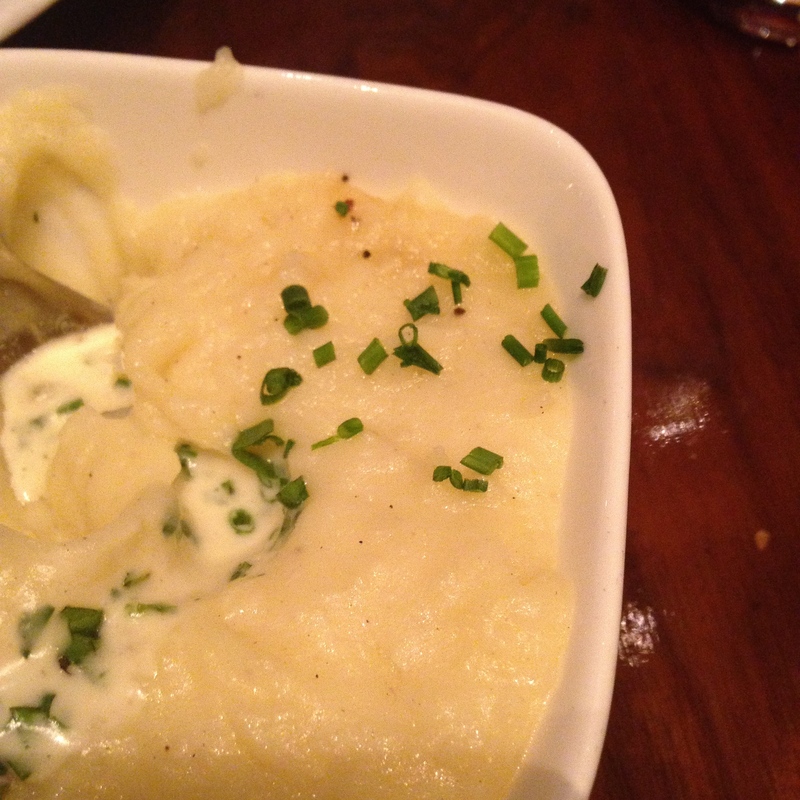 I have to say the mashed potatoes were also among the best I have ever eaten. Unfortunately, we had a show to go to, so we could not enjoy the dessert there, but I am sure it would also have been outstanding. In hindsight we should have skipped the show and had dessert at Flay’s Mesa Grill. Our experience at Emeril’s New Orleans Fish House was tainted by the fact that we had an overly chatty waiter who went on an on about sports betting. My husband and I are are not into sports or betting – we were there to enjoy a meal and each other. The waiter became a third wheel. The Jambalaya was really good there, but I was underwhelmed by the other foods that we ordered. Their bread pudding was good, but not the best I had ever had. 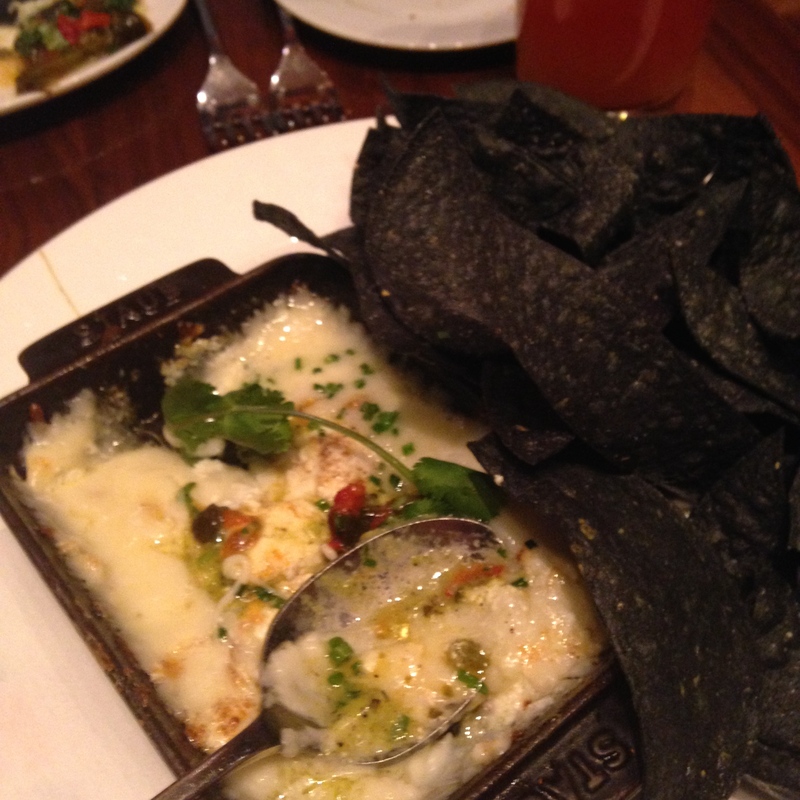 Categories: Eating Out | Tags: Mesa Grill Las Vegas | Permalink.